How much younger are we getting? Why not play for others? What do we have to lose? Start with small open mike venues. Best to drop all you know about being safe in front of others…it is enough to simply let your true passion show in your playing. When playing in front of a group, I feel that I have one real responsibility. It is to listen to my heart and the vibrations and intentions emitting from my flute. If the feelings and sounds are in integrity and in agreement with my feelings, and I’m doing the best I can, that is enough…you cannot and need not do better. This is always enough for our current stage. And it gets better as you go! You have to be willing to crawl, then walk, then run…soaring…and moments of greatness can happen right away as well! Gary Leatham, Ancient Sounds, Inc. The bamboo or the tube is only half of the shakuhachi. The other half is the player’s body, mind and breath. The character that is there will always come through in the sound. 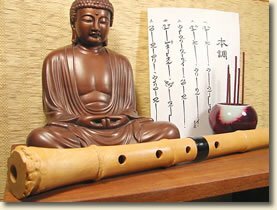 I have always said that if one is not in a process of learning not to harm oneself and others, that is a process of learning compassion in a deep way, while learning shakuhachi, then one isn’t learning shakuhachi. Maybe one is learning how to play a bamboo flute, but not shakuhachi. That would be using the bamboo as an instrument, but not allowing it to teach oneself in the process. The whole point is learning from the bamboo, learning from the process. Together—bamboo, mind, body, breath—instrument of peace. If this is the process and my intention, then that will come out of the flute, no matter what material the flute is made of. The Bamboo Way. Website for Mary Lu Brandwein (Night Singing River). 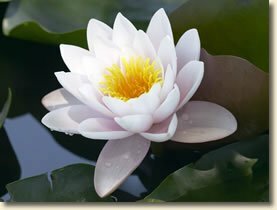 Shabkar.Org is a non-profit website site dedicated to vegetarianism as a Buddhist way of life. The site takes its name from Shabkar Tsodruk Rangdrol (1781-1851), the great Tibetan yogi who espoused the ideals of vegetarianism. Lessons, workshops, performances, retreats and CDs from Michael Chikuzen Gould, shakuhachi performer and teacher. Darek is a shakuhachi maker and an artist. His site offers an excellent selection of shakuhachi links as well as his art. Shakuhachi teacher and maker. Fine handcrafted shakuhachi and free instructional materials. Your purchases on this Shakuhachi Yuu website greatly assist Naljor Prison Dharma Service / SourcePoint Global Outreach, a 501(c)(3) nonprofit organization. We provide teachings of nonviolence and compassion and a 29-page Resource Directory for Prisoners to men and women in prison throughout the United States. In addition, we provide solar power flashlights to villages in developing countries without access to electricity or safe, sustainable forms of lighting. Nyokai-An is the shakuhachi dojo of Phil Nyokai James, who teaches regularly in Boston and in Portland, Maine. Nyokai-An is the New England branch of Yoshio Kurahashi’s Mujuan shakuhachi school. Philip Gelb is actively involved in 2 careers; as a shakuhachi player and teacher and also a vegetarian chef. Phil has become one of the most active performers and teachers in North America. Philip Gelb runs the Bay Area shakuhachi School, teaching traditional and modern music to over 30 students, with branches in Oakland and Santa Rosa, CA. Professional quality shakuhachi of all sizes, student flutes, shakuhachi accessories and teaching materials. Monty Levenson has been a craftsman of fine shakuhachi for 35 years. Bamboo musical instruments, specializing in quenas and bamboo saxophones.